A red flag: "I don't want you to see me as an authority figure"
If your boss or academic advisor says something like “I don’t want you to see me as an authority figure,” that’s a major red flag. It almost always means that they want to get away with breaking the rules about what powerful people are allowed to do. They’re probably not treating you as an equal. They’re probably trying to exercise more power over you than they should. They want you to do something. It’s something that it would be wrong for an authority figure to order you to do. If they were a peer asking for a favor, it would be ok to ask, and also ok for you to say no. The authority figure wants you to obey them, but they don’t want to accept limits on what it’s acceptable to ask you to do. For purposes of “what requests are ok to make”, they don’t want to be seen as an authority figure. They also want you to do what they say. It’s not really a request, because you’re not really free to say no. It’s usually ok to ask your friends if they would be willing to help you move in exchange for pizza. It’s never ok to ask your employees to do that. It’s sometimes ok to ask a friend to lend you money for medical bills (depending on the relationship). It’s never ok to ask your student to lend you money for a personal emergency. Abusive emotional intimacy: Excepting you to share your feelings with them, or receive their feelings in a way that’s really only appropriate between friends or in consented-to therapy. Coming to you for ongoing emotional support in dealing with their marital problems. Trying to direct your trauma recovery or “help you overcome disability”. Asking questions about your body beyond things they need to know for work/school related reasons. Expecting you to share all your thoughts and feelings about your personal life. Analyzing you and your life and expecting you to welcome their opinions and find them insightful. If someone says “I don’t want you to see me as an authority figure”, it probably means that they can’t be trusted to maintain good boundaries. (Unless they’re also saying something like “I’m not actually your boss, and you don’t have to do what I say”.) Sometimes they are intentionally trying to get away with breaking the rules. Sometimes it’s less intentional. Some people feel awkward about being powerful and don’t want to think about it. In either case, unacknowledged power is dangerous. In order to do right by people you have power over, you have to be willing to think about the power you’re have and how you’re using it. 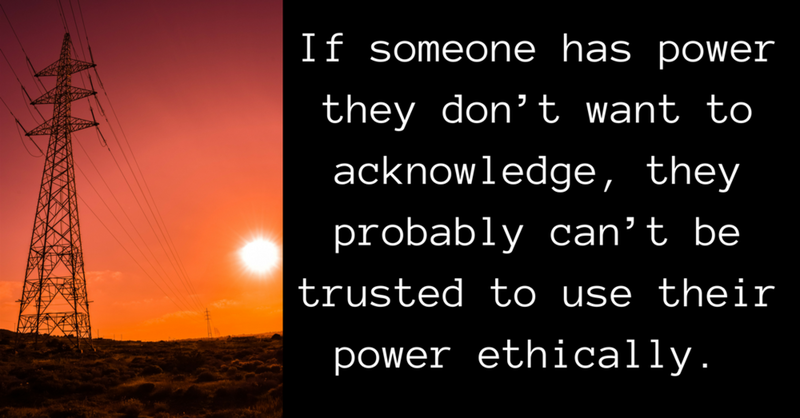 Tl;dr If someone has power they don’t want to acknowledge, they probably can’t be trusted to use their power ethically. Newer Post"I never do x" vs "When I do x, it doesn't count, because it's justified".